Apartment was clean when we arrived and rooms were spacious. Host was very easy to contact in case of emergency. Location was perfect, not too far from central London. Located near great restaurants and convenience stores. Quick walk to Camden Market and the underground station. Good location. Had a washing machine and wifi. Lock issues were remedied the same day. Excellent location and super convenient travel by tube to anywhere. The local area was also awesome with heaps of pubs, restaurants and cafes. The location in Camden was very nice. Close to city & nice neighbourhood with a lot of cafes and restaurants. Nice old victorian style building. It was a cousey flat, it felt a little old, but it served its purpose. The staff was very nice at reception, willing to help you with everything, and that´s very important anywhere you stay. Although the accommodation wasn't where I thought it was going to be (they tell you where you're going to stay when you get there), it was still fairly close to my original planned stay. My friends and I loved the location of the apartment as well as the space and cleanliness. It was near underground, a lot of space in apartment and very good connection to the airport in the early morning. Located in London, Camden Market Apartments is 350 feet from Camden Market. London Zoo is 2,650 feet from the property. The accommodations features a flat-screen TV and CD player. There is a seating and/or dining area in some units. There is also a kitchen, equipped with a dishwasher, oven and microwave. A toaster and refrigerator are also offered, as well as a coffee machine. Every unit is fitted with a private bathroom with free toiletries and a hair dryer. Towels and bed linen are available. Regents Park is 0.7 mi from Camden Market Apartments, while St Johns Wood is 1.4 mi away. The nearest airport is London City Airport, 8.7 mi from Camden Market Apartments. 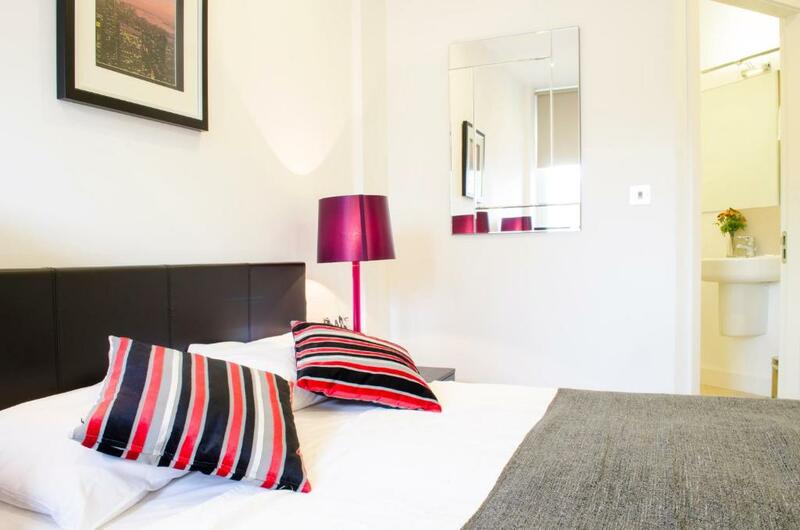 When would you like to stay at Camden Market Apartments? This apartment features a toaster, dishwasher and seating area. This apartment features a dining area, DVD player and toaster. House Rules Camden Market Apartments takes special requests – add in the next step! Camden Market Apartments accepts these cards and reserves the right to temporarily hold an amount prior to arrival. Please note, a cleaning fee of GBP 40 must be paid in cash upon arrival. A damage deposit of GBP 300 is required upon arrival – that's about 388.67USD. This deposit is fully refundable at check-out as long as there's been no damage to the property. Unfortunately this apartment did not meet expectations after looking at the listing on line and based on the description and pictures. The carpet was really dirty and we felt uncomfortable walking on it without shoes. The smell in the apartment was also extremely unpleasant. If we were staying longer than 3 days we would have definitely moved. There was only 1 bathroom for 7 people. There was only one standing fan in the whole apartment (it was summer) so it got hot really often. It felt really homely with really clean rooms. no hairdryer, no plugs in bath or sink, torn bed linen. Avoid this apartment. I booked the apartment close to Camden Town Tube (2mins walk) for my friends from Asia. The check in staff misleading my friend to stay one night in booked apartment, and move to different apartment a day after. The second apartment is 20mins away from tube. Located in horrible dark street. The check in staff was rude and ignorant, when my friends asked to move back to 1st apartment, she shouted and offered 15% discount of rate. They rejected the offer, but she asked them to move out. They have no choice but compromised with 2nd apartment. The apartment I booked have 2 bathrooms and with washing machine. They ended up with one bathroom and no washing machine. We believe that they sold our booked apartment for more money and moved us to smaller unit. Bear in mind that we paid £852.00 for this horrible experience (before 15% discount offered). Booking.com was useless too to resolve the issue. Only offer to help to look for similar apartment nearby. We already booked the apartment via Booking.com, how can Booking.com asked us to move to different apartment. The location was not at the address stated on the Booking.com website. I specifically chose this apartment because of its location, near to our home. No mention was made of flats in other locations. All in all, a con. Deliberately misleading, and very annoying. Confirmation apartment address was different from the apartment we were allocated so not a great start. Also there were hidden fees which were not listed in the original Booking.com confirmation !! Upon entry, we found the toilet door handle broken; stained upholstery; the oven wouldn't turn off, had to flip the trip switch in power box which was held together with gaffa tape! Several repairs required immediate attention. Had to take photos of all previous damge found so that we would not be blamed for it. Office staff were pleasant enough but they are only an agent for the properties. They don't manage or maintain them, that's the owners responsibility. For a modern apartment it's rather worn in. Not worth the high price charged in my opinion. Early access to apartment. Good location. They manage different apartments and you will get not necessarily the one in the description. They gave me an old apartment, I had to complain and they changed it for a better one. 10 mins or so walking distance to the tube and bus stations.. The second and third room beds were too small. Only for one person. WiFi wasn’t working for two whole days and now he person on call Jane was rude to say that it’s not an emergency. It was an emergency for someone running on USA time. There was only 1 bathroom for a 3 bedroom apartment that supposedly fits 8 people which made things very difficult. The water boiler did not work very well. The water would only be hot for 30 seconds at a time then ice cold for 30 seconds and so on. No trash pick up or location to throw out trash during the week. The ceiling had leaks and was getting moldy. The host only provided one set of keys which was also difficult to coordinate. Apartment supposedly located on "2nd level" which was actually 3rd level if you include the Ground Floor. The photos shown when you look up "Camden Market Apartments" do not match what the apartment really looked like. We got a different appartement than the adress that we booked, which was fine, but was not mentioned at the check-in, so we were a bit confused as we were meeting our friends there and had to communicate the new address, which was further from the tube. Also the appartement was mostly clean, but had dust for examples on the windows (were you had to push to open/close them). Also there were no basics in the kitchen like salt or oil. Small beds, but we like each other so it was ok to cuddle. The two bedroom apartement exeeded all our expecatations, it was great! It was not as in the centre of Camden Town as it showed on Google Maps, was a bit further out than we thought. Also had a little invasion of Ants, but did find ant powder in the cupboard.